Integral handle for easy moving. Attractive design for high profile environments. Fitted with a lock as standard. NO – liner or sack required. Ideal for collecting confidential paper. 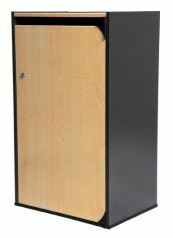 Lockable unit ideal for confidential paper. Complementary signage available for this item. Double skin moulding throughout for exceptional strength. Slam shut door with 4 strong latch points. Units can be linked together to form ‘recycling zones’. The Maxi Envirobins are now available with full colour doors to match the WRAP compliant insert. Maxi Envirobins come complete with moulded-in bolt-down points and integral ballast. 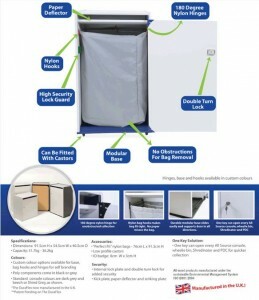 For confidential document collection and disposal. Narrow paper slot prevents unauthorised removal of contents. Strong and secure patent pending, tamper-proof locking system. Supplied with body and lid graphics. * DELIVERY CHARGE of £25.00 exc VAT on Orders under £250.00 exc VAT. * FREE DELIVERY on Orders over £250.00 exc VAT. * DELIVERY CHARGE of £15.00 exc VAT on orders under £100.00 exc VAT. Very stylish in an office location. Space on top can be used for printers or fax machines. 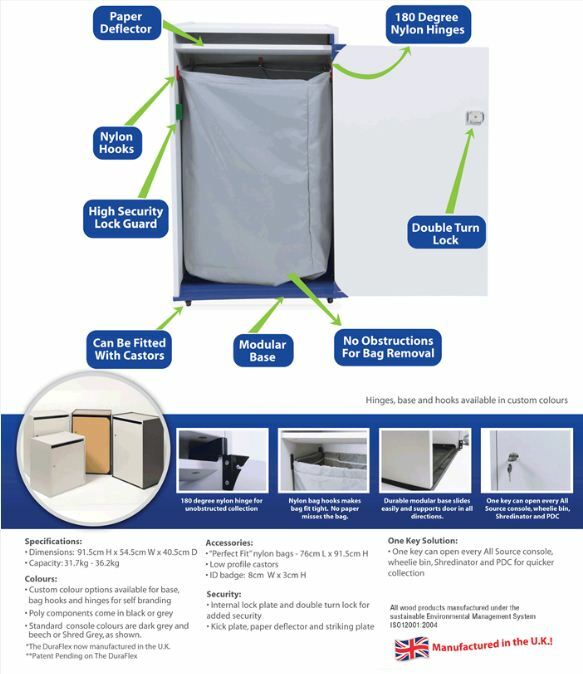 Designed to discreetly house a sack. Perfect fit nylon bags (no paper misses bag). Durable modular base slides easily and supports door in all directions. Bespoke colour options available on request.